Tips to Avoid Golf Injuries. It takes a minimum of 6 weeks to condition the musculoskeletal system. The first 4 weeks of a rehabilitation program stimulate the neuromuscular response in a muscle but do not build strength. Perform 2-3 sets of 10-15 repetitions of each strengthening exercise with approximately 70% of the 1 repetition maximum. Try to strength train 3x per week and not on consecutive days. Seek the advice of a physical therapist for specific exercises and workout routine. When golfers return to the golf course after several months of inaction, they may experience a variety of golf injuries. Before returning to the golf course, golfers should begin training the musculoskeletal system, which takes about 6-8 weeks. A well-trained musculoskeletal system can better withstand stress and strain and prevent injuries. 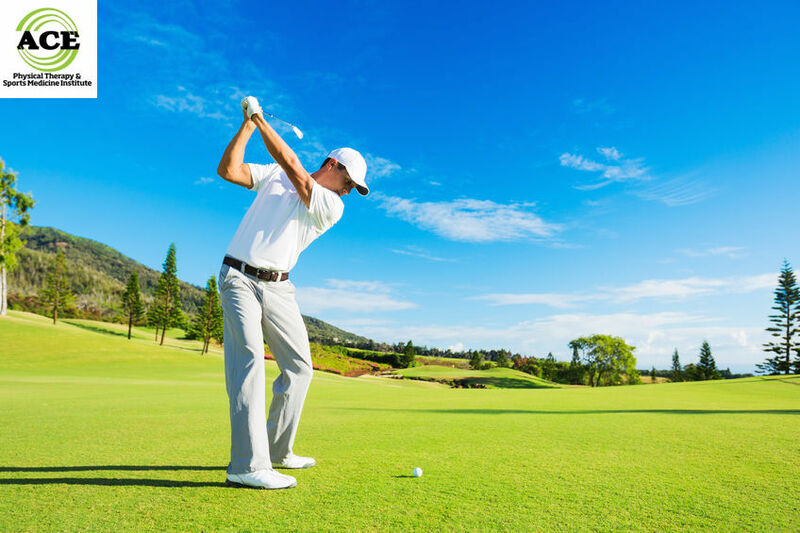 Physical therapists can help golfers prepare their bodies correctly by educating them on the proper exercises and helping them develop a conditioning program. Back pain: The spine is not designed to withstand the compressive or sheer forces that occur during a round of golf. Players must twist, bend and assume some postures that are unnatural for the spine and are too stressful for the static stabilizing structures. To avoid injury, strengthen the muscle structure so that it can provide dynamic stability to the joints of the spine. • Pull Aparts: Stand and hold a piece of Theratubing of appropriate tensile strength in your hands. (Rubber tubing can be purchased at most sporting goods stores or ask your Physical Therapist for a piece.) Arms should be at or near shoulder level, and the elbows should be fully extended (straight). Your palms should be facing each other so that the thumbs are pointed towards the ceiling. Slowly move arms apart and stretch (“pull apart”) the Theraband. In the final phase of this exercise, take your shoulder blades and squeeze them together. • Push Ups (STANDARD): The Push Up position can be modified, so everyone can perform this exercise. Push-ups are an excellent exercise to build strength in the chest and arms. • Doorway Stretch (Corner stretch): Stand in the opening of the doorway. Place both arms on the doorway frame with the palms flat against the frame. Your arms should be above shoulder level and near each corner of the frame. Slowly move forward until you feel a stretching sensation in the front of your shoulders and chest area. Elbow pain: The golf swing and the gripping force on the club handle make the elbow susceptible to injuries such as Golfer’s elbow or Tennis elbow. The elbow has two prominent bony projections that are the attachment sites of the muscles that flex or extend the wrist and fingers. If a golfer grips too aggressively or miss-hits a shot, these muscles/tendons can become injured, causing pain and weakness. A relaxed grip and good technique can prevent these injuries. • Wrist Flexion: Support your forearm on a stable object while allowing your hand and wrist to remain unsupported. Using the same arm, hold a weight in the unsupported hand. The palm of the hand should be facing the upward. Slowly allow the dumbbell weight to roll down the fingers. Once the fingers are nearly extended, begin the exercise by curling the weight back into the palm of the hand with the fingers. • Wrist Extension: Support forearm on a stable object while allowing the hand and wrist to remain free and unsupported. Using the same arm, hold a dumbbell weight in hand with the palm of the hand facing downward. Slowly raise the weight by moving the back of hand towards the forearm. • Stress Ball Squeeze: Find a stress ball, therapeutic puddy, sponge, ball of socks or a rolled towel and begin to squeeze it with all of the fingers. • Rubberband Finger Extension: Place a rubberband (or several) on the ends of the fingers near the finger nails. Slowly spread fingers apart and feel the resistance of the rubberband. Knee pain: The knee joint is known as a modified hinge joint. The movement is primarily in flexion and extension, but there is a slight amount of rotation. Unfortunately, the movements in golf place a great deal of rotational stress or torque on the knee joint and at times the forces are too great. This can lead to strains and cartilage damage. Joints require dynamic muscular support to help prevent injury, and the knee joint requires more than other joints due to the anatomical structure. • Ball Hamstring Curls: Lie on back and place ankles and heels on the Theraball. Raise buttocks off of the table and pause. Once you get steady, slowly bend both knees as you begin to roll the ball towards your buttocks. Bring it in as far as you can, pause and then roll back to the beginning position. Try to keep your buttocks off of the ground throughout the entire exercise. • Squat: Stand in front of a chair as if you are going to sit down. Your feet should be shoulder width apart. Begin to “sit” down slowly and barely touch your buttocks to the chair seat. Return to an erect/standing position. These exercises are the basics for the involved joints and body parts. Your physical therapist can make sure that you perform them correctly because an exercise that is performed incorrectly can cause pain or an injury. The physical therapist can evaluate you, and adjust your exercise routine to address any specific physical ailments that are present. Golf is a great game but it can cause injuries to body due to the stress and strain that is placed on various body parts during the swing. By starting a conditioning program 6-8 weeks prior to beginning a golf season, players can reduce the likelihood of golf injuries.